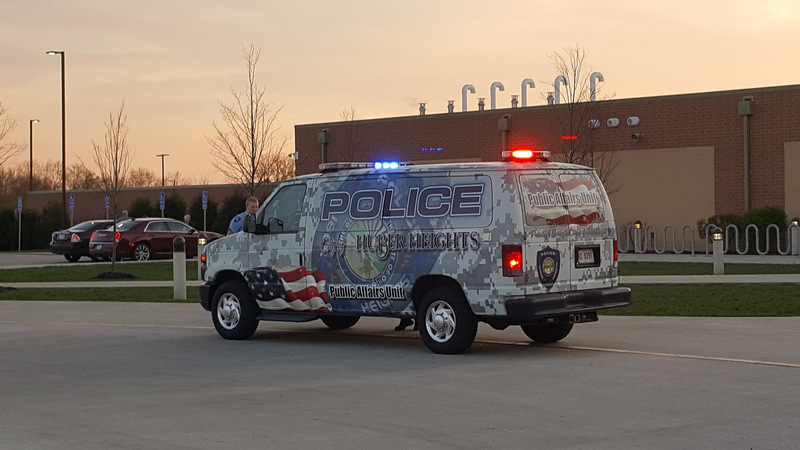 The Huber Heights Foundation hosted a Police vs. Firefighters Volleyball charity event this past week at Wayne High School. The money raised goes towards the Huber Heights City Schools and scholarships for its students. This event featured SWAT and police vehicles for the public to get a look at. The Huber Heights Police Explorers were on-hand looking dapper in their uniforms and providing support for the event. McGruff the Crime Dog was there to take a bite out of crime and do some dancing with the State Farm Bear mascot. Mayoral candidates were present along with representatives from several organizations including the Huber Heights Chamber of Commerce. We certainly had a great time watching this event. I’m happy to report that the police department shut out the fire department and took the trophy. I might be a little biased seeing as I’m retired from police work myself. I have to hand it both the PD and the FFD though. Those teams really worked hard out on the court and gave everyone a good clean game.